Replacement and renewal are the twin pillars of commerce. If things run out, we buy more, whether it be bread or washing powder, a CD player that has given up the ghost, or a shoe with a hole in it. But what if the shoe does not have a hole in it? What if the stereo is not broken? All the same, we buy new ones, perhaps because the design of the shoe no longer looks au courant, or because the stereo has been superseded by a more technologically advanced model. There is a constant need to upgrade, to get the latest model or (in the case of fashion) to look like the latest model. To our minds the things in the shops are more modern, more stylish, far superior to the things we already own. The need to renew things is what consumerism is all about. Looking at the store designs on these pages, it is easy to imagine a pillbox-hatted Kim Novak, or some such, sashaying through their elongated doors. Yet that is an indication of quite how forward-looking they are, for they date from a period as much as 20 years before the heyday of the Hitchcock blonde. All of them – taken from the collection of Jim Heimann – were drawn up between 1938 and 1950, that post-Depression era when the US economy, in contrast to that of a war-battered Britain, grew in both size and confidence. 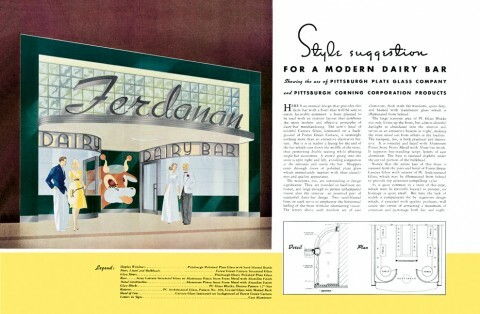 Some of them, with their stark right angles and profusion of windows, could almost have come from a Bauhaus drawing board; crucially, in their more flamboyant elements they also bear the influence of the Exposition Internationale des Arts Décoratifs, that great show of European chic that persuaded American architects to up their game. 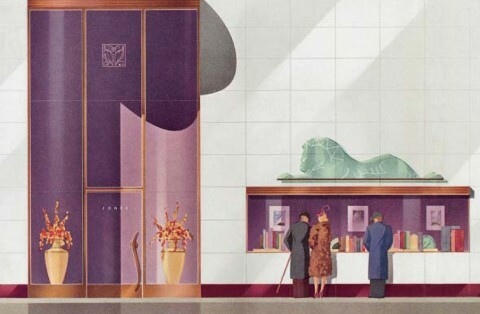 It was Art Deco that introduced Modernism to the masses, and it was, for the most part, the retail industry that introduced Americans to Art Deco. Perhaps the most striking aspect of the designs is the use of various types of glass to “open up” the shops to the public. A major new trend was the elimination of the psychological barrier that existed between street space and retail space – thus, picture windows evolved into entire storefronts of glass, proscenium arches that drew the eyes of passers-by into the inviting interior. Rather than focusing on window dressing, this aquarium effect allowed the entire shopfloor to become a display of sorts. In many cases, these glass façades extended upwards for two or three storeys, providing connotations of grandeur and luxury, and – more importantly – making the optimum use of the space available. Another popular solution to the problem of a narrow shopfront was the recessed entranceway. 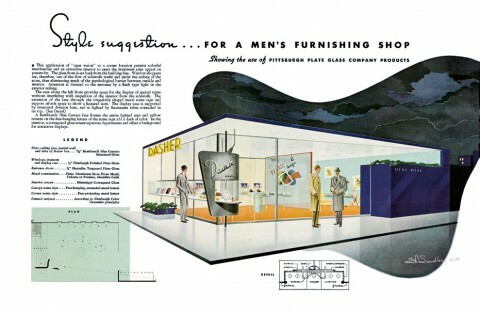 According to 1940s retail psychology, setting the door away from the street created a funnel effect that sucked in potential customers; it also maximised the amount of display space, creating a sort of museum case full of products that extended inwards from the street. If said display windows were made of hi-tech curved glass, then so much the better. Indeed, in the case of one barber-shop design, the curving panel of the entranceway is decorated in diagonal red, white and blue stripes, riffing on the traditional barber’s pole. Many of the other designs also play on the idea of a façade specially tailored to its product. 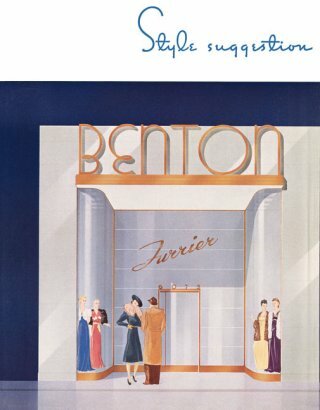 An upmarket milliner, for example, displays hatted mannequins through small porthole windows, evoking the upscale luxury of a transatlantic liner. A jeweller has freestanding display posts at the edge of the pavement, little bronze parking meters that display items of interest and, presumably, attract the attention of jewel thieves. The question of what would happen if such a product-specific shop changed hands is not difficult to answer: start again from scratch, of course, taking into account the latest developments in fashion and materials. So who was the mysterious hand behind these designs? Well, many of the pictures bear the signature of one Elmer A. Lundberg, who, further investigation reveals, was a bigwig at the Pittsburgh Plate Glass Company. This explains the often somewhat glass-centric tone of the accompanying texts. (“An outstanding feature of the front is the use of Solex Heat Absorbing Plate Glass in large panels on the main façade. The purpose of this glass, which is transparent, of a definite greenish cast, and which transmits less than 43% of the total solar heat, is to admit daylight generously into the store interior while keeping it comfortably cool on warm days.”) And it also indicates the true purpose of these shopfront designs, many of which, one can safely assume, were never built. For while the retail industry likes to foster a desire in consumers to acquire the very latest products, it is no less susceptible, no less likely to fear that it is being left behind. Put simply, these drawings – however much they are tarted up with talk of retail psychology – are designed to sell glass. Their pointed modernity spells out one simple message: buy our product. First published in World of Interiors issue 298. Reproduced with permission.